You regularly organise events for your clients? You wish to innovate and increase your event’s return on investment? Our virtual event platform will enable you to commercialize your booths to exhibitors, to attract an increasing number of visitors and finally to market locations to advertisers through an actual Advertising Agency. Our platform is turning out to be the ideal tool to generate qualified leads and communicate with them in private. You want to communicate about your commercial activity? You want to put an emphasis on your offers and thereby benefit from an innovative brand image? Our virtual event platform will allow you to directly introduce your products and services to qualified contacts. Visitors will have to register and fill out a form in order to access the online fair. The social media integration on the platform will enable you to keep in touch once your event is over. You organise meetings on a regular basis however your colleagues are dispersed all over different sites? You would want to waste less time and optimize the budget allocated to meetings or workshops? Our solutions meet those needs to offer a real dynamic and collaborative participation. Multiply and simplify exchanges between your colleagues around a workshop and conference space. Those tools are efficient ways to practice internal training, or even to communication on the best practices to share. Virtual events were not designed to replace traditional events. You may even want to couple your physical event with a virtual one, to create what we call a hybrid event. Digital transformation is underway, our consumption patterns are changing and our practices are evolving. 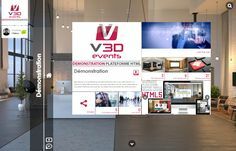 Through this innovative platform, V3D Events can offer an adequate response enabling you to organise real online events. With the HTML5 linguistic code evolution, the new platform is achieving an unprecedented performance and a quicker page load time. New features have also been ergonomically incorporated to this new platform such as being able to drag and drop media or manage comments! The user experience has been completely improved to make the new platform more ergonomic and more accessible. 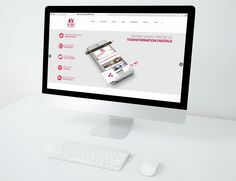 Responsive web design technology ensures an ergonomic, adaptive and reactive navigation, for any type of media used: whether it would be a computer, tablet or smartphone. The latest back-office innovations allowed event organisers to independently and intuitively organise, manage and animate one or more virtual events. The whole platform was designed for customers to be more intuitive and easy to use. Each feature have been reworked to facilitate interactions between various participants. This version offers many advantages such as group chat, instant messaging and vidéo chat that allow exhibitors to converse with a visitor.